What are Lump Sum Payouts? 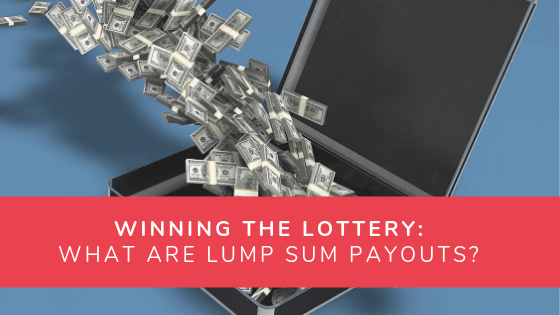 Winning the Lottery: What are Lump Sum Payouts? A lot of people—especially those new to lottery—think that when you win, you get your money, and that’s it! It’s nice to think that it’s that simple—but the reality is that it’s a lot more complicated. Before you can even touch a single cent of your winnings, lotteries often give you two choices: receive your winnings as a lump sum or as annuity payouts. I already covered the basics of annuity payouts as far as lotteries are concerned, so in this article I will be talking about the lump sum option. What is it exactly? And why should, or shouldn’t, you go with it? Join me as I take a closer look! What is a Lump Sum Payout? As the name suggests, lump sum payouts mean that your winnings will be given out as a single cash transfer, as opposed to annuity payouts where payments are made over time. To put it another way, lump sum payouts allow you to get full, immediate access to your winnings. It isn’t much of a surprise then, that most winners tend to go for the lump sum option. After all, who wouldn’t want to immediately enjoy all their winnings, right? The beauty of choosing the lump sum option over annuity payouts, however, go beyond simply getting all your money all at once. While you do get to take home a much smaller prize amount (due to taxes et al.) when you go for a lump sum payout, if you invest it wisely your money could grow bigger than the entire amount of an annuity payout. What other benefits do lump sum payouts offer? Alternatively, what disadvantages can you expect? Let’s find out. Why Should You Choose a Lump Sum Payout? Lump sum payouts allow you to immediately access your winnings. No need to wait for 20 or so years! The value of money could depreciate in the future, so getting all your winnings right now might be more beneficial. That said, it could go either way as the future is uncertain. You are free to invest all your winnings if you wanted to. In fact, most experts would tell you to do just that if you go for the lump sum. Doing so would allow you to grow your investment to a point where it passes the total of what you would have gotten if you went with the annuity option. Why Should You Avoid a Lump Sum Payout? Lump sum payouts are usually slapped with hefty taxes, so expect your prize to be smaller than what was advertised. For example, if you won the $1.5 billion Powerball jackpot last year and chose the lump sum payout, that would have been a one-time payment of $930 million. By the way, that’s a pre-tax figure. If you live in the United States, you would have paid a whopping $368 million in federal income tax—which leaves you a little over half a million dollars. It’s easier to succumb to nasty spending habits when you have immediate access to all your winnings. I’m not saying it will happen, but so many lottery winners have proven that it doesn’t take much to go from riches to rags. If you prefer taking home all your winnings and don’t like waiting for two or three decades to get everything, choosing the lump sum option on your lottery win is a good idea. Sure, because of hefty taxes, you’re more likely going to get a fairly small sum compared to the entirety of what you’d get if you chose the annuity option. But then again, you could invest that lump sum and easily make it grow. On the other hand, getting all your winnings as a lump sum might not be advisable if you’re the type who has a hard time controlling your urge to go on a lavish shopping spree. Having the entirety of your prize readily available is a huge temptation—one that could drive you to bankruptcy in no time. As always, it is better if you get help from a financial adviser after winning and plan out your finances. How is the pre tax lump sum payout calculated? I never understood that. In the above example you state the $1.5 billion dollar winning ticket received a pre tax lump sum payout of $930 million. Hi Rob, the particulars depend on the lottery in question. Typically, though, the lump sum amount is determined first: it’s simply the jackpot rollovers from previous draws, along with sales for the current draw. To calculate the annuity amount, which is also the advertised jackpot amount for the draw, lotteries then take the lump sum amount and estimate how much it would grow based on the market interest rates for the securities that will fund the rest of the annuity payments.